Here’s one I didn’t see coming: according to the Jiji Press, Yokohama has agreed to post righthanded reliever Hiroki Sanada. This will be Yokohama’s first usage of the posting system, as previous BayStars alumni Kazuhiro Sasaki and Takashi Saito moved MLB via free agency. I don’t expect Sanada will be a hot commodity on the posting market this offseason. He’s never been a strikeout machine, but he dipped to just 18 over 49 innings of work in 2011. That may be explained by a drop in velocity. But more importantly, I doubt he drew much scouting attention over the course of the season, as few would have anticipated him being posted. As such, he’s probably headed for a minimal posting fee and a minor league contract. As a side rant, this is exactly the kind of player the posting system works against. If Sanada were a free agent, he could fly to Arizona and throw a few bullpen seasons for scouts and potentially find a fit for himself. Instead, he’ll have to hope that a team that has already seen him chooses to bid during the four days they are allowed to. NPB Bullet Points returns with an all-photographic collection of non-sequiturs. Let’s begin. Yokohama’s Seiichi Uchikawa can levitate, to the apparent dismay of the umpire. In other Yokohama news, Kimiyasu Kudoh, 46, become the oldest pitcher to win an NPB game. Rakuten manager Katsuya Nomura has a new watch. Where did he get such a lurid timepiece? You guessed it, from his goofy wife. For those of you that can read Japanese, I’ll include this link, where Nomura refers to his bullpen as not “stoppers” but “strippers”. Chunichi slugger Tony Blanco is big, but not as big as a sumo wrestler. Here’s a rare sighting: empty seats at Koshien. Hanshin drew fewer than 30,000 fans at Koshein for the first time in almost five years. The incomparable Deanna snapped a shot of the Marines fans holding up signage indicating that 63,580 fans have signed a petition requesting the team to keep Bobby Valentine around beyond this season. My fellow Chicago ex-pat Matt of Yakyu All-Stars took a picture of Norichika Aoki’s WBC Gold Medal. I gotta say, that’s pretty underwhelming. Looks like it’s filled with chocolate. Simon has pics of Kazuhiro ‘Daimajin’ Sasaki throwing out the first pitch to Jose Canseco at a recent BayStars game. Fresh off his failure to knock out Danny Bonaduce, Canseco wanted to take Daimajin deep, but even though he got nine pitches he couldn’t do it. 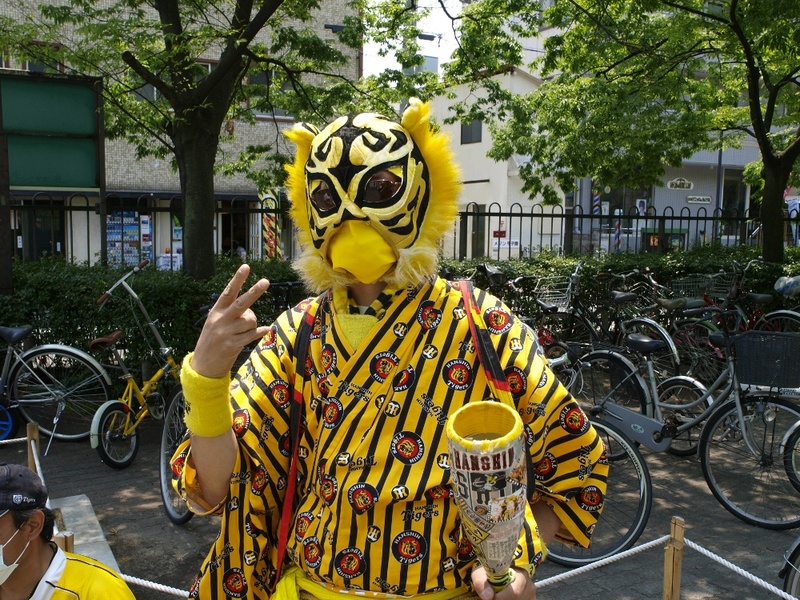 Marines lover Steve gives us a pic of a fairly typical Hanshin Tigers fan.